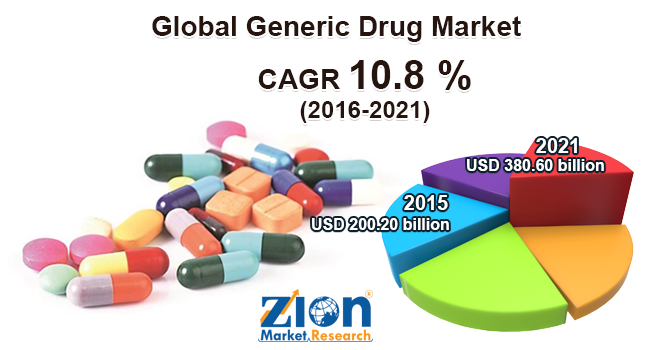 Zion Market Research has published a new report titled “Generic Drug Market by Brand (Pure Generic and Branded Generic) for Central Nervous System (CNS), Cardiovascular, Dermatology, Oncology, Respiratory and Others Therapeutic Applications - Global Industry Perspective, Comprehensive Analysis and Forecast, 2015 – 2021”. According to the report, the global generic drug market accounted for around USD 200.20 billion in 2015 and is expected to reach approximately USD 380.60 billion by 2021, growing at a CAGR of around 10.8 % between 2016 and 2021. Pharmacology is the study of drugs and medicines, including their uses, effects, and characteristic. Generic drugs are chemically identical to their branded counterparts. Although, generic drugs are bioequivalent to branded drugs, they are sold at the significant discount from branded drugs prices. As per the FDA approval, the generic drug should contain the same active ingredient as their branded counterpart; it should be bioequivalent and should meet batch requirements for identity, quality, purity, and strength. It should be identical on the route of administration and dosage form. It should be manufactured under the same rules and regulation of FDA’s good manufacturing practice required for branded drugs. Generic drugs manufacturing companies are capable of selling generic drugs at the lower price because they are not required to repeat costly clinical trials and pay for marketing and promotion strategies. Globally, the market for the generic drug has been propelled by new government initiatives to produce generic drugs and mainly to promote the use of generic drugs against chronic diseases. Patent expiration of branded drugs is one of the key influencers for the growth and prime reason for generating more revenue for generic drugs market. Moreover, new emerging markets of developing countries and low cost of generic drugs are majorly responsible for thickening the growth of generic drugs market. In spite of this, the market is affected by high competition within the globe and it is due to, economic expenditure required for the production of generic drugs is the very low thus number of leading companies taking interest in the production of generic drugs. In future, new developing and uncovered markets may responsible for the generation of new opportunities. The market of the generic drug has been segmented on the basis of the brand as pure generic drug and branded generic drugs. Branded generic drugs are marketed under another company’s brand name but they are bioequivalent to their generic counterparts. Due to high involvement of companies in manufacturing pure generic drugs, pure generic drug segment is dominating the market. Based on the therapeutic application the market of generic drugs has been segmented as central nervous system (CNS), cardiovascular, dermatology, oncology, respiratory and others. With more than 20% revenue contribution, the cardiovascular segment was leading the generic drug market in 2015 due to a number of patent expiry of cardiovascular drugs. With more than 15 % revenue contribution, central nervous system (CNS) will show significant growth in the forecast period. The market of the generic drug has been segmented into North America, Europe, Asia-Pacific, Latin America and the Middle East & Africa. North America is dominating the generic drug market due to high demand and increasing the prevalence of chronic diseases. Asia-Pacific is expected to show good growth in the forecast period. In Asia Pacific, India and China are leading countries in the genetic drug market. Key operating players for generic drugs market are Teva Pharmaceutical Industries Ltd., Novartis International AG, Mylan N.V., Abbott Healthcare Pvt. Ltd., Actavis Pharmaceuticals and Sun Pharmaceuticals.